This debut novel is an enchanting account of the natural history of a crow named “I AM” and his observations on a peculiar mammal called Keeyaw, especially one named Noah, who is intent on cutting down tall trees where the crows nest to build an ark. The close relationship of the crows with nature contrasts with the destructive behavior of the Keeyaws. The daily activities of I AM are mixed with an imaginative raptor lore, including the cycle of life, where the spirits of the dead cohabit the bodies of the living. I AM discovers the secrets of life from a variety of characters, including his mother, named Our Many; an elderly, deformed mystic called Hookbill the Haunted; and the mighty God Crow. Hookbill’s death facilitates I AM’s rescue during the Great Flood, his important role in the discovery of land, and the beginning of a new world. This engrossing story includes the unimaginable realities surrounding the living conditions on Noah’s ark during the flood. 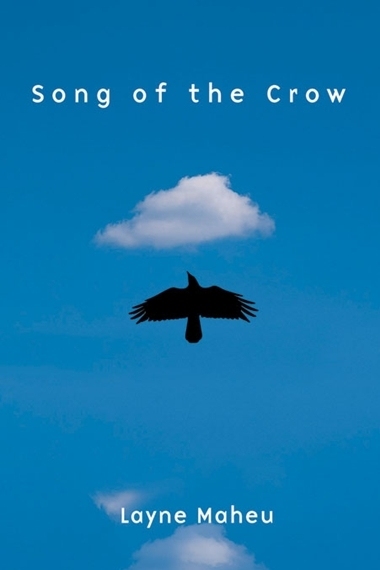 After reading this remarkable book, you will marvel at every crow you see along the side of the road and maybe even begin to listen to their songs. Highly recommended for all collections. In a surprising take on the tale of Noah’s ark and the flood, Maheu’s beguiling debut unfolds from the perspective of a crow….Maheu’s fable works beautifully, probing the relationship between creatures of the heavens and those of the underworld. From the moment that he looks down on the ancient gray head of Noah, who is swinging his stone axe, the narrating crow in this unique and remarkable epic knows that these creators called Man are trouble. He senses, too, that the natural order of things is about to change. At a time when so many of us are searching for meaning, Layne Maheu’s debut novel lingers in a masterfully rendered ancient world just long enough to ponder our fears of disaster and to watch as humanity struggles to survive, to understand, and finally to prevail. Recalling both the magical imagination of Richard Adams’s Watership Down and the spiritual richness of Anita Diamant’s The Red Tent, Song of the Crow is a soaring debut. It was our mother. But from where? Where? Who could tell with the wind chasing her calls? I saw her, a few trees away. She appeared on one branch, then another, then in an altogether different tree. But it was just the yes and no of the wind heaving her perch and whipping her feathers into a confusion of leaves. Why didn’t she swoop onto the nest and stuff food into us? So what choice did we have? Though I’d never left the deep of the nest, I reluctantly climbed up to the fatal jump. There was no way we could survive it, but Our Many must have known there was no way we’d survive the falling of Our Giant either. And to die at least trying, even though you couldn’t fly yet, was a way to fly off to the Tree of the Dead. Any death before that was no death at all, but only a quick flight into whatever fate befell you—flies and maggots and stiff feathers and dust. The only way to become a true crow was to fly. Until then you were nothing, without a name; flying was all. My Other was still in the deep of the nest, trying to stand back up, while I picked my way through the hurling twigs and stuck my beak into the headwinds. They howled yesss across my face. They howled yes and no in biting, utter cold. I’d never felt anything like it. But then, this was my first experience beyond the bowl of our nest. As our tree bent, the underworld was thrown into view, first one side of our nest, then the other. I was so scared and astonished, I would have kept going if it weren’t for my enormous bony feet holding me back. Below was a mad sea of branches thrashing every which way. What lay below all the layers of bushes and vines I could not see. But I was hungry to fly. Or fall. Or eat the air. I had to wrap it in my wings, if you could call them that, just bare bones and points. For this very reason, infant crows are discouraged from the edge of the nest. Some just cannot overcome the urge to lunge out and grab hold of the wind and plummet, or whatever the feeling is that takes hold of your wings, even though there are no feathers anywhere yet to fly. It was worse than I could imagine. Our mother still urged us out. But I found myself awed and calm in the stinging headwinds and wanted to take in as much as I could before casting myself down into the depths of a short life in the unknown. The whole world swayed on its stem, complaining. There was no bottom to the world, while our nest was filled with stuff from down there, or so I was told. I looked and saw only the green hurling movement below. Until I saw a sight yet stranger still. Through the flying leaves and broken branches, I finally saw him, the monster, the mythic, the beastman, Keeyaw. He was much farther from our tree than I had thought. Not an army, or a gathering of many, as I’d learn was the case with his kind, but just one, one beastman like no other, separated from the rest of his kind, Keeyaw of the lank figure and mournful mustaches, low, groveling, hunkered over from the weight of his implements and the white, colorless beard that hung from his face in a way he had no control over. It just hung there and swung as he worked. And his eyes—those suspicious, unseeing orbs he occasionally turned to the sky as though he were about to be scolded and were constantly being watched—how could eyes sunk so far back in his skull ever see a thing? And his tools—they say he was the first to use tools, that he invented them. According to the lore of his kind, this was his gift to the world. And it was always upon us. All around us, the trees had been severed from the air and hurled to the underworld. And somehow I took a strange pity on this supposed Doom of the Trees. It seemed his grim hacking away at the Giants gave him no satisfaction whatsoever. Instead he seemed trapped in a landscape of irritable brooding, and taking his anger out on the mute Giants gave him no escape. Still, it was his only answer, which he repeatedly struck. My Other finally plucked his way up to the nest top. He perched much closer to the edge than I did and spread his prickly wing points out to catch hold of the howling, but he failed to jump. He just crouched low and did what I did. We sat there and wondered about this Keeyaw creature from the heaving edge of the nest. Then My Other picked himself up and whipped his tiny bones in the direction of the powerful gusts. I realized she’d wanted to join us at the nest but didn’t want to reveal our whereabouts to Keeyaw. Though we thought Our Many had been calling us out to fly, she must have meant it for Keeyaw. Crows have no alarm call for walk off, or grovel your way back across the underworld. Fly was the only call she had to drive Keeyaw away. And she dove down to mob him, strafing his whiskery head. But the wind weakened her attack. When she dove after him a second time, a sudden gust nearly pushed her up against the trunk. So she hung on to the trees between us and the beast, looking at him, then at us, then back to him, full of hesitation, until it turned to weary patience. So I dove back into the safety of our nest’s inner bowl and closed my eyes, until I felt more acutely the heaving and roiling of Our Giant through the air. My fearless Other, who was already practiced in the ancient art of imitation, stayed up in the headwinds and made the sound of Keeyaw’s ax just fine. But no crow could imitate the sound of a tree falling, like the rippling of violent thunders, darker than doom, worse than the end, broken limbs, loose leaves flying. Frightened birds and creatures took off. Then our mother fled. The branches of our own tree sank, and there was a silence, like a weight falling in my chest. We felt the whole world tilt. When the Giant hit, the woods exploded. Each bounce brought more thunder, until it stopped. The forest was never so quiet as then. Except the cooling of the wind. And the murmuring of the yes. And the murmuring of the no. And the sighing beneath the leaves, waiting for the final word. Soon the rhythm of Keeyaw’s ax resumed. And the wind picked up, arguing again through the grizzled mat of the beastman’s beard, and My Other could imitate, with the high, nasally pitch of parody, the sound Keeyaw made, hacking away at the underworld, rending the tree of its branches, and the beastman would hesitate and look up, full of woe and worry, swinging those awful implements over his head and then down again. Tunk, tunk, tunk, sang My Other. And Keeyaw’s mournful mustaches shook.